It happens all too often: you’re driving along, enjoying the long-awaited summer weather with your favorite song playing, when your car kindly warns you (i.e., emits a loud, obnoxious ding) that it’s time to refuel. So you detour to the nearest gas station, fill up, and are on your merry way. However, it might not be so merry if you’re not using the right fuel. Most car owners, understandably, fill up with the cheapest fuel available—usually 87 octane—but depending on what you’re driving, you could be damaging your car by using the incorrect fuel. In this article, we’ll talk about what different fuel designations mean, why they matter, and most importantly, what type of fuel you should put in your car. For the sake of both brevity and clarity, we’ll stick to discussing only gasoline-powered cars, as diesel vehicles are a whole different story. Before we start about what type of gas to put in your car, it’s important to know what the different designations mean. Gas is classified by its octane rating, which is a number typically between 87-93. A fuel’s octane rating is a way of quantifying its ability to resist “knock” or predetonation—Warning: technical explanation incoming—but trust me, it’s important to understand! Gas engines compress an air-fuel mixture and then ignite it with the use of a spark plug. But if the air-fuel mixture combusts early—via the compression of the piston rather than the ignition of the spark plug—this is called knock, and is not how the engine is designed to run. Therefore, higher octane fuels are able to better resist knock, or detonation via compression. For this reason, higher octane fuels, 91 octane and above, are considered premium. So, now that you understand the basics of fuels and their knock resistance, you can better understand why certain fuels are better for certain cars. The type of fuel to use hinges on the compression ratio of the engine it goes in. The reason performance cars use higher octane fuels is because they have higher compression ratios (10:1 or higher). In other words, they squeeze the air-fuel mixture tighter, which means they need fuels that can resist combusting during this squeezing. Normal cars however, don’t have such high compression ratios, so they operate just fine on regular fuel. Do you really need to buy the expensive stuff? So what should you put in your car? Well, the easiest way to tell is by sweeping the cobwebs off your owner’s manual and cracking it open! Whatever the manufacturer recommends is what you should put in your car. Contrary to what some may think, you’re not treating your car by filling up with higher octane fuel than what it requires. If your car can’t make good use of the premium fuel by compressing it tighter (having a higher compression ratio) the only thing being treated is the gas companies bank account. Stick to the manufacturer recommendation, and you’ll be in good shape! So, we’ve covered what happens when you put premium fuel in a car that doesn’t need it – nothing–but what happens when you put regular fuel in a car that requires premium? While it’s easier to think that it will explode upon startup, there’s of course a more accurate and technical explanation. One tank of regular won’t kill a car that takes premium, but the repeated use of regular fuel can damage the vehicle in question. The reason we refer to predetonation as knock is because in older cars with less advanced engine monitoring systems, it would cause an audible knocking sound. However, newer cars are able to adjust ignition timing, to an extent, in order to cope with the lower octane fuels. This doesn’t come without costs though. Using fuels with too low of an octane rating will cause a noticeable decrease in both fuel economy and performance. However, if the premium-only car has a high enough compression ratio, the engine computers may not be able to adjust properly to the lower octane fuel, and an audible knocking can occur. This will eventually damage certain engine components. So, there you have it! 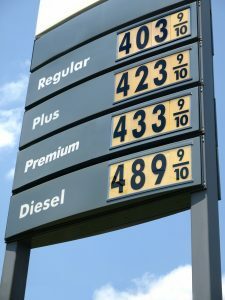 Those are the basics on octane ratings, why they’re important and how to know your cars drink of choice. I’m a firm believer that every car owner should know the basics of how cars work, and now you’re one step closer! So, next time you’re at the pump, check your owner’s manual first so your car can enjoy the summer road-trips just as much as you!